The best £3.50 ($5.99) I've spent in a while. [UPDATE] I've now burned a CD with his favourites (which just happen to be the hairdryer, clothes dryer, vacuum cleaner and womb sounds) and it is working an absolute treat. This shot was taken at the RHS' Harlow Carr Gardens when we went there for a day out on Jill's birthday on the 11th. It was a glorious sunny day, and we had a lovely time. It was a case of fourth time lucky, as we've tried to viist three times before, but always been scuppered by being too late or the weather. Nathan was absolutely shattered at the end of the day (there's a good picture of him crashed out in the Baby-Bjorn I was carrying him in alongside the shot above on Flickr). I'm not going to add any more here now, as it's getting late, and I've had far too little sleep recently. I'll try and update later this week. This photo sort of summarises Easter morning. 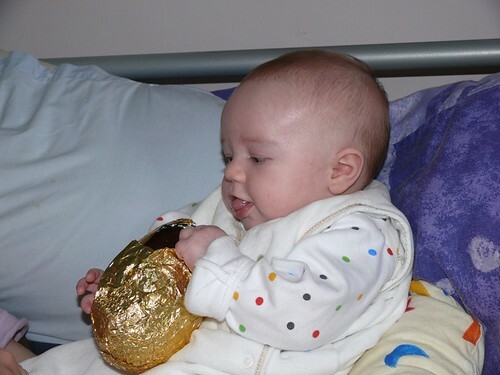 Nathan was fascinated with the Easter Eggs! Ohh! Shiny! You can see more by either clicking through the picture above, or by going and seeing thumbnails of the last thirty pics of Nathan I uploaded on the photo-album page. UPDATE: Just to clarify, no, we haven't been feeding Nathan chocolate. He just liked the shiny wrappers! Nathan's personality is really beginning to show now as he hits three months of age. On Saturday night we think we made a mistake by not giving him a bath before bed as he was tired. He went to sleep, but woke up every three and a half hours rather than the four to six he has been doing since he went in the cot. Tonight, when we put him in the bath, it was very funny. He was so enthusiastic, trying to crawl out of my arms and leap into the bath with Jill. I had difficulties holding him back. Once he was in the bath, he showed some new tricks, grabbing and throwing and trying to chew the ducks he has. That and trying to drink the bath when we weren't looking! When I got him out he followed that up with peeing on his towel and giggling about it for the second time in a row! He's also been doing some of what Jill calls 'tummy time', and seems to like it, practising his crawling and head holding. He's also getting quite insistent that he wants to try sitting up. We've had the quietest Easter in a long time, staying at home with no visitors. Good Friday saw us in Leeds for some shopping (getting Jill a coat from the ever excellent Bravissimo store). Saturday saw Jill taking Nathan into Wetherby, while I finally painted the half of the kitchen that we abandoned doing a year ago or more. Easter day itself had us puting a sleeping baby in the pram and walking along the disused railway track to Spofforth. We didn't go all the way – and it seemed a lot longer on foot than on the bikes we usually use – but it was great to get out in the sun and fresh air. When we got back he was still asleep and we left him in the pram while we had a coffee and a sit in some garden chairs with a book. In my case this was the CJ Cherryh novel I was reading back when Jill was in the hospital waiting to give birth. Fortunately, I can remember the plot from earlier! About the only thing I've forgotten to do is phone Alix, Sam and the kids in Germany, which I remembered too late in the evening. Something to try today if I remember. I always forget the time difference between them and us. It was far harder when they were in Cyprus (as they were further apart in time zone) but it's something I should remember. As usual, I've some new pictures, but haven't culled and uploaded them. I'll try that later today! I had a bit of a surprise today, as the copy of CS2 Standard that I ordered earlier in the week was at home when I got in today. It wasn't meant to arrive until 6th April at the vendors, let alone be on my doorstep. Naturally, I installed it this evening. The initial installation took about 25 mins, with a further hour nearly to download and install all the updaters. It's times like this when I whistfully consider whether I should upgrade my DSL connection beyond 1M/sec. 160 Mb data still takes a while. Considering the installation is all run from within an update program, it was a disappointment that I had to enter the admin authorisation for every updater, but I guess that's the price of security and it should only be a single hit. The initial impression I have of the software – Photoshop CS2, Illustrator CS2, InDesign CS2 plus the Bridge and Version Cue systems – is that although it takes longer (maybe two or three times as long?) to load, it seems pretty fast once you're in it. However, this should be taken with a pinch of salt as I haven't done any serious manipulation here. If the impression is correct, then I've made the right call and a fast G4 with a bucket of RAM is a fine machine for the package. However, only time will tell. InDesign will take some learning; I think I may go and see if there are any night school classes in Harrogate again like the ones I did for Photoshop and Illustrator some time ago. However, It's probably a lot better for BITS and other writings than iCalamus is (as it's pretty much one of the two industry standards and integrates so well). I seem to be getting all the materials together for a workflow to restart writing - Scrivener for the text smithing, Word/InDesign for layout, and Photoshop/Illustrator/OmniGraffle for illustrations. I guess the ending point to this is a tip. If you have an old version of Photoshop, be sure to check out the Jigsaw website. They appear to be offering an upgrade to CS3 Design Premium for £616 inc VAT. As the list price is £1385 inc VAT that's a great deal. Wish I'd seen it first (although, I'm guessing that I'd have resisted because it's somewhat more than I paid for CS2)! Nathan had his first swimming session last week with Water Babies. He went through the whole gamut of emotions - crying, laughing, smiling during the half hour. It was a great day, and Jill really had fun. I felt really priviledged to be there, and got some nice photos which I'll put up next time I upload to Flickr. Last night was also a bit of a milestone. Nathan's been struggling to stay the whole night in his crib, so we decided to try him in the cot. Jill had been talking to one of her (cohort?) 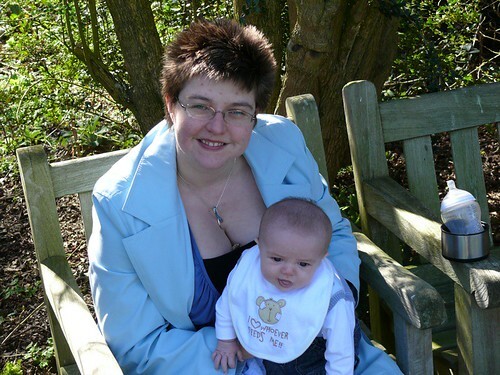 fellow new-mums who said that she'd had the same problem until her daughter went into the cot. So we tried it, and it seemed to be a good night for both Nathan and myself! I've long used the various Adobe products (Photoshop, Illustration, GoLive and Acrobat) but resisted buying the Creative Suite once that became available because of cost. Anyway, I've reached the end of the line for my current versions (Photoshop 7, Illustrator 10) so had to make a call to upgrade to avoid falling off the upgrade ladder (Adobe keep the number of back versions you can upgrade fron a lot tighter than they used to). I'm feeling a bit gouged by it because you can upgrade from Photoshop (or an equivalent product) or from the earlier versions of the Creative Suite. You don't (in any way) have a way to get other versions of the software considered (so I can only take 1 product into consideration when I upgrade). Anyway, I decided that the £700+ that was wanted for a full upgrade to the soon to be released Creative Suite 3, and bought an upgrade to CS2 in clearance for substantially less!